Derrick Coleman has a Duracell endorsement and a chance at a championship ring, but things were not always as bright for Coleman as now. The average NCAA D1 athlete practices over 30 hours a week along with a full class load. The pro-athlete hopeful spends weeks at a time doing nothing but training. Not every person has that kind of discipline and even more so, that kind of talent. Derrick Coleman was passed up in 2012 for the NFL draft. The NFL basically told him, “You can’t hack it,” but Coleman didn’t listen. His track record was enough to speak for its self. He had the talent to play for UCLA. He showed up, did well, and was as tough as everyone else. He did not get things easily but never made an excuse. He made himself known on the field for being a great running back with immense speed and had no issue with commitment. He is now framed for 2014 Super Bowl stardom, but why was he left undrafted in 2012? Oh, that’s right because they saw him as liability… he’s deaf. The now viral Duracell commercial shows Coleman in situations throughout his life where people told him he couldn’t succeed, but because he has been deaf since the age of 3 he can’t hear them. (http://www.youtube.com/watch?v=u2HD57z4F8E) He alludes to major issues of being Deaf in the mainstream culture such as not being given an alternative to vocal directions or people misinterpreting his inability to hear with his ability to play football or his intelligence level. What I find so uplifting is how he aligns him being Deaf as a hurdle and his strength. Negative words and other people’s opinions are only as powerful as you let them be. Coleman’s Deafness gave him the ability to not hear all those things and follow his dream. After the fall out of Sherman’s remarks to the press and the general tension around the team’s and fans’ imagine as a whole, suddenly Coleman is looking less and less like a liability and more of a likability. We all know that’s what counts on Facebook. 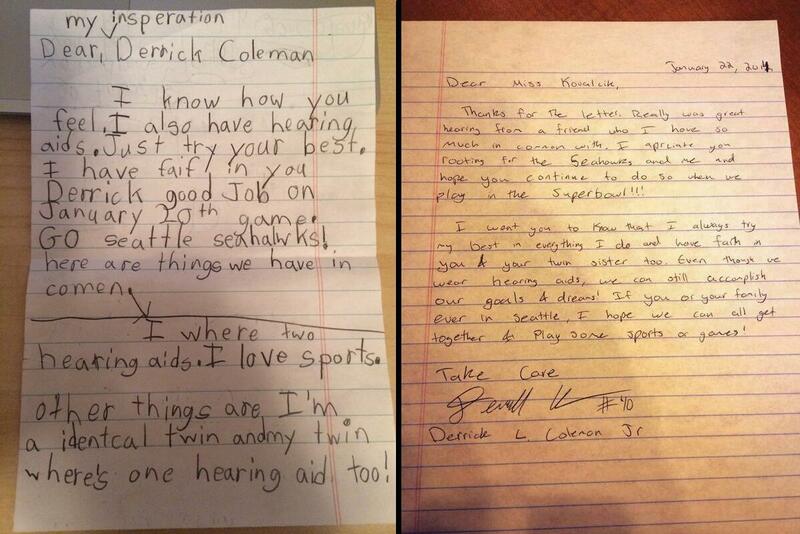 How can you not like a man that personally responds to fan mail from children? By thedeafdream in Uncategorized on March 29, 2014 .